There is nothing I love more than scoring a good deal and with Amazon Prime just a few days away I am gearing up for another day of massive savings. If you are new to Amazon Prime Day is like Black Friday in July. It’s when Amazon marks down prices on 100,000 of items! Since I am an Amazon Prime member (a great way to get deals year round) I am able to get a sneak peek and what is going to be on sale. And my wishlist is growing every single day as more items get added to Amazon’s Prime day list! Before we dive in I do want to mention that you need to be an Amazon Prime Member to get these deals, but don’t worry. If you aren’t one I have a link that you can use to try it out for FREE for the next 30 days. Try Amazon Prime now – click this link! Check it out and see just all the crazy fun things you can do with a Prime membership. I have been a member for almost 5 years now and I can honestly say I have saved way more money than the membership costs. When your family is scattered all over the states anytime you can get free shipping is a big-time money-saving perk. And that is just what you get with Amazon Prime and not just regular shipping either, but free 2-day shipping which can come in pretty handy when you are late for yet another Birthday……ahem. Once you are signed up with Amazon Prime or if you are already a member, just click this link and you will be able to peek at all the deals coming up on Amazon Prime Day! Ninja Tip: Find a deal you don’t want to miss? Simply click “watch this deal” to make sure you get a reminder when it goes live! Winner-winner! If you are brand new to Prime Days click this pink link and you can easily get on to the sale! Amazon Prime Day is July 16th, so mark your calendars and set your alarms. It’s Black Friday in July people!! Get on your matching T-shirts and goofy holiday hats. (well, maybe not the hats!) and join me for some crazy shopping. Haha, be there or be sad you missed out! Tips to rock it out on Prime Day 2018!! Scroll the list below or head over to Amazon and get your favorites, click the Watch Deal button. Don’t miss when they go on sale! Stop back HERE often for updates so you can save time hunting. Quick list of my favorites! 5-quart programmable Crock Pot. I am SO buying this baby! How about an Instant Pot for 40% off?! I LOVE these glass containers and they are so cheap I am in shock! My mom just paid double the price listed! Toss all that plastic and switch to glass. If you don’t like the crock pot listed above, try this one instead! This one is a little pricey, but if you can afford it you might just want to check it out. My BFF has one of these Bissell Floor and Carpet Cleaners. She SWEARS by it! Wall Mounted Spice Rack. Use this for spices, the office or even the craft room! Side pocket car organizer with change holder. My kids LOVE this and now that it’s finally on sale I am grabbing more for holiday gifts this year! I just love this microwave cart! You can use it for anything really and free up space in your kitchen. Oh, and this microwave cart too….a bit pricey but so nice!! These packing cubes are great if you like to travel or even as a gift. I bought my two oldest boys each one of these hanging toiletry bags and they just love how easy it is when they are traveling. And let me just say I paid a heck of a lot more than the $11.99 sale price. Have kids in your car? Then this car organizer will keep things neat and decluttered for you! Are you drowning in family photos but just can’t throw them away? Here is a unique way to display your photos so you can cherish your memories rather than bury them. The awesome large basket that I reference about 20 times on my blog just went up for sale! Grab it quick before it runs out! Are you short on garage space? Well, this pretty awesome overhead ceiling mount storage is pretty awesome! If you are old like me, then hauling a large basket of clothes is no longer easy to do. That is why I switched to a bag. This laundry bag makes hauling clothes so much easier on my back, plus this bag has things sectioned off to make it even nicer! Another car organizer that I love, with those darn plastic bags it is hard to keep tomatoes from rolling around my car. With this organizer, rogue tomatoes are no more! Looking for extra space in your closet? These drawers are durable and nice too. And you knew this was coming….the Fitbit is on the list! I love to use my Fitbit to remind me of things I need to do throughout the day. Plus my picks for yesterday! My favorite organizing tool is my Amazon Alexa. I love that I can set a timer and challenge myself to declutter before it is done. Now you can get an Echo for a fraction of the cost just click THIS LINK or THIS LINK and hurry before it’s over! 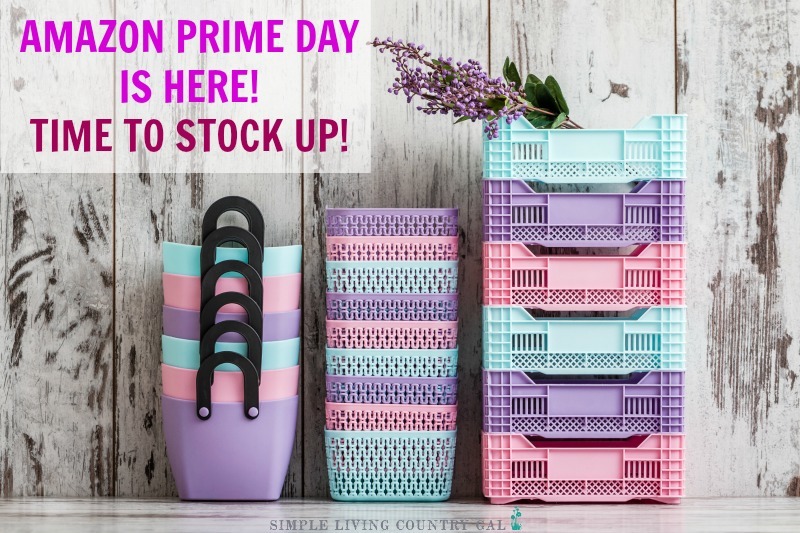 https://simplelivingcountrygal.com/wp-admin/post.php?post=10069&action=edit#I love those space saver bags and you can score them at $10 off! Click THIS LINK to get then quick. I don’t know about you but my kitchen towels are looking pretty ratty! And guess what I just found…..yeppers! Amazon deal #3 is kitchen towels for $10!! Use THIS LINK to check them out. Donate those old kitchen towels and clean out and declutter that drawer. Okay, kids, this one is expensive BUT it’s $100 less than what I paid for it! This is the Alexa that I have and LOVE. I was able to remove my timer, radio, cd player, CDs, half my cookbooks, and more. I know it’s a lot but I swear she is worth every single penny. Use THIS LINK to see the deal. I am so jealous of this deal!! I watch recipes on her while I cook them. I create lists on her to keep my schedule organized. I listen to audio books on her while I am baking. About 7 years ago we canceled all of our subscription television and purchased a Roku streaming device. That baby saved us over $1200 a year. Over the weekend a friend of ours was telling us of her Fire Stick. She said it is just like the Roku and guess what?! It’s on the deals list today and 50% off! $20 for a streaming stick so I can save hundreds? Yes, please! Here is the LINK for you to find out if this will work for you. This is not a huge deal, but I am hoping it gets lower as the night winds down so you might want to watch it. These hangars are the best invention ever. The non-slip surface keeps your shirts from stretching at the shoulders. If your clothes look better longer you will buy less and keep that closet from cluttering up! Click THIS LINK to check them out. Oh, boy, do I wish I could get myself one of these babies! My sister in law has one and she never has to sweep her kitchen floor. I really hate to sweep my floor and to have it done every single day like clockwork is almost enough for me to invest in one of these! If you can swing it you might want to take advantage of this deal. Follow THIS LINK to check out the Roomba at $120 off…eeeek! This one just hit now! If you are a jewelry hoarder this baby will let you keep every single piece…eeek! I have never seen anything like it and it might not be for everyone, but check it out and see if it is for you. Use THIS LINK to catch the deal. Totally not decluttering at all….but…..if you are a crafter here is a LINK to the page of deals. I might be enabling a bit but as a fellow crafter, I just had to share! This one is not quite live yet but maybe when you read it so click THIS LINK asap and grab yours before they are gone. Storage bins for toys that I love to use for all kinds of things. A bin in the family room for blankets and pillows, and of course several in your kid’s rooms to make clean up super easy so they can do it. Hi I signed up awhile ago Tracy,and I don’t think I got your free mini planner? Unless it was just something that got in a email? I don’t remember…so could u send it to me again? Thanks so much hun.